Inclusions: Entrance fees to Monet’s house, workshop, the Norman and Water Gardens and tickets to Auberge Ravoux. Private tour guide, private roundtrip door-to-door transportation, taxes, tolls and parking also included. Cost of lunch is not included. 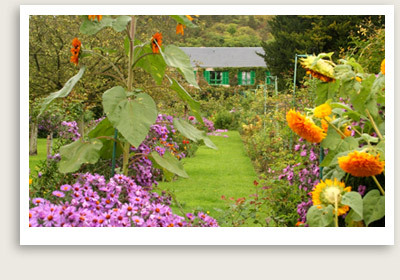 This Giverny guided tour first takes you to the charming village of Auvers sur Oise, where Vincent Van Gogh spent the last 100 days of his life painting some 70 works. Private guided visit of the house of Van Gogh’s friend Dr. Gachet; Van Gogh’s last residence, Auberge Ravoux; and the church of Auvers immortalized by Van Gogh, with private visit to Theo and Vincent Van Gogh’s tombs. For lunch, we highly recommend Moulin de Fourges, a waterfront restaurant complete with a 150-year-old watermill… fabulous food, picture-perfect setting and great prices. This Giverny guided tour gives you a private guided introduction to the life and work of impressionist painter Claude Monet. You will have a guided tour of Monet’s house and workshop, the formal enclosed Norman Garden, and the romantic Water Garden with the Pond and Japanese Bridge. You will also enjoy a visit to the Museum of American Art. On your way back to Paris, your expert tour guide will take the Route des Crêtes, a charming scenic route from which you can glimpse the Seine Valley; a beautiful 10th century watchtower; and the village and the fabulous château of La Roche Guyon, headquarters of General Rommel during World War II. Your private tour of Giverny & Auvers sur Oise also includes a stop at the village of Vetheuil, where Monet lived for three years.